Tania Romualdo has been interested in Chinese culture and history since she was a little girl. Honored to be the ambassador of Cabo Verde to China, she regards it as an opportunity to have close contact with China’s rich and diverse culture. She has already been to many places in China and experienced a variety of cultural elements, and she is now trying to learn about traditional Chinese medicine and experience it too. In addition to her cultural experiences, she shared with CSST reporter her opinions about relations between her country and China. CSST: We went to Cidade Velha during our trip to Cabo Verde. We learned that it has great historical significance and it also attracts many tourists. Can you talk more about the city? Tania Romualdo: Cidade Velha was the first capital of Cabo Verde and the oldest settlement in the country. It was built at the time to serve the slave trade. Slaves caught on the western coast of Africa were brought to Cidade Velha. They learned how to work on the cotton fields, and then they were shipped to Brazil, Colombia, Venezuela, the United States and the Caribbean. Therefore, Cidade Velha played an important role during the slave trade between Africa and the Americas. CSST: Apart from Cidade Velha, can you share with the readers other places of interest in Cabo Verde? And what is the biggest challenge between the tourist cooperation between the two countries? Tania Romualdo: Cabo Verde is known for the sea, sand and sun, but we also have mountains, a very rich and diverse culture and many other tourist attractions. We have ten islands, each with distinctive features. The only one without inhabitants is Santa Luzia. It is a protected natural reserve because there are some specially protected species—birds mainly. And we also have very specific cultural manifestations. For example, in Fogo, we have the typical religious celebration on the first of May. But now, not that many Chinese people come to Cabo Verde every year, mostly because of the difficult connection. There is no direct flight. You have to take at least three flights. This makes the trip itself much more expensive, and it takes a long time. Therefore, improving the connection between China and Cabo Verde is a very big challenge at this moment. If this trip becomes easier and cheaper, the country will be much more attractive to Chinese people. CSST: Gavin Menzies, a former British Royal Navy officer, argues in his book 1421 The Year China Discovered The World, that Chinese explorer and diplomat Zheng He and his fleet rounded the Cape of Good Hope and went North following the African West Coast. Then a serious storm took them to the archipelago, presumably to Santo Antão. And here, as in other places they visited, they left behind “carved stones” in order to provide evidence of their presence to later generations of explorers. Have you heard this story? Tania Romualdo: I heard about the stone on the island, but I have not seen it personally yet. It definitely is an attraction for Chinese people and represents proof that the relations between our two countries can date back to 600 years ago. CSST: Would you say that West Africa’s security situation has always been this way, or has it really changed since 2010 due to the influence of North Africa? Could you elaborate upon the progress that Cabo Verde has made in regard to terrorism, piracy, drug trafficking and other threats to security? Tania Romualdo: The security situation in Cabo Verde changed after 2010 because of the influence from North Africa. Everyone is aware of that unfortunately. In the whole continent and particularly in West Africa, there are some terrorist groups. Recently, there has been some slight improvement due to the actions of some governments in our region. But it is a fact that the threat is there. Cabo Verde is not continental, but we are in the region. No one is safe, and security is one of the main concerns of our government, too. The sea security is especially vital for us because we are an island country, so our government wants to make sure that our seawaters remain safe. For now, we don’t have a real and present threat on our seas, but we must be aware that the risk always exists. Concerning drug traffic and money laundering, Cabo Verde belongs to the Intergovernmental Action Group against Money Laundering in West Africa, which is an institution of the Economic Community of West African States responsible for facilitating the adoption and implementation of Anti-Money Laundering and Counter-Financing of Terrorism in West Africa. Cabo Verde has been very active in this group and we hosted some of the meetings recently. CSST: Do you have any advice about cooperation between China and Cabo Verde in terms of security? Tania Romualdo: China was one of the first supporters when we were fighting for our independence back when we were still a colony. We became independent in 1975, and diplomatic relations between the two countries were established in 1976. To date, the cooperation between the two countries in several areas has been excellent. Therefore, I believe that in security we can look deeper at these kinds of issues too and work on them. CSST: Do you think that China’s expertise in infrastructure cooperation could benefit Cabo Verde? Do you have any suggestions for increasing bilateral cooperation on infrastructure construction? Tania Romualdo: The cooperation in the field of infrastructure was quite strong during the first years of our relationship. And China was responsible for the construction of some of our signature buildings and infrastructure, like the palace of the government, the palace of the parliament, and, very recently, the palace of the President was also refurbished by the Chinese side. Our national stadium, home to our Blue Sharks, was built by China too. Now, we still need China to help us build other infrastructure that is very important for the development that we want to achieve. Maybe in different ways now, I mean we are looking for Chinese investment in infrastructure, like ports and energy. CSST: We visited the Poilão dam in the Santa Cruz municipal area in Cabo Verde. Could you talk about the role the dam plays in your country? Tania Romualdo: Yes, it was the first dam to be built in Cabo Verde. It is a project worth $4.4 million and was financed by the Chinese. The dam, which is 26 meters high and 25 meters wide, covers an irrigated area of 630,000 square meters, and it serves one of the poorest areas of Santiago Island, with a population of around 33,000 people. Many people thought that it was impossible to build a dam in the country. But it happened. And it plays a significant role on improving the living conditions of the people living in that area. Before the dam was built, the farmers could only cultivate during the rainy season, which usually lasts from July to October each year. But now if it doesn’t rain for several months, they can still work using the water in the dam and have their income. After this one, several other dams were built, so infrastructure is very strong in our cooperation. CSST: Can you share your thoughts on the role of the Chinese diaspora and companies in Cabo Verde, and what role they should play in the future of bilateral exchanges? Tania Romualdo: They can play an important role not only as businesspeople doing their jobs and creating job opportunities for local people but also as participants in people-to-people exchanges between the two countries. Official relations between the two countries are already mature and growing very well, but there is still a lack of better personal knowledge between people from both countries. Last year, the Association of Friendship Between Cabo Verde and China organized the first meeting of Chinese people in Cabo Verde, and it is a positive sign that people have started to form a community and carry out exchange activities with people in the islands. CSST: How many people from Cabo Verde are now in China? Tania Romualdo: The number is very small—around 350—and most of them are students in diverse areas, like international relations, mechanics, electronics and medicine. Almost all the students had at least one year of intensive Mandarin training when they arrived in China because language can be one of the biggest problems when they try to communicate with people here. These students have had a very positive influence on people-to-people relations because they have had the opportunity to witness Chinese culture. CSST: Do you have any suggestions on what the governments should do to promote bilateral ties in all areas? 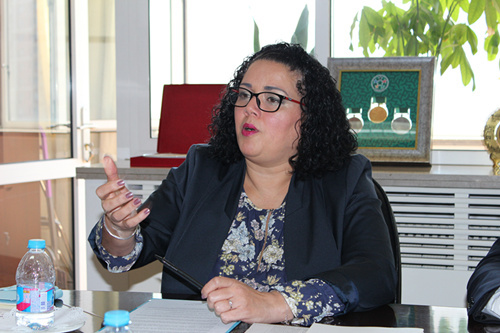 Tania Romualdo: I think both governments have made strong efforts, and our cooperation is very good. But we have reached a moment in which it’s important to take the next step, which is to enhance the quality of our relations to a more comprehensive and strategic level. As President Jorge Carlos Fonseca and Prime Minister Ulisses Correia e Silva of Cabo Verde expressed on this year’s May 20, when they met with Chinese Foreign Minister Wang Yi in capital Praia, Cabo Verde is willing to further deepen bilateral cooperation so as to forge Cabo Verde into a strategic cooperative partner of China and the best friend of China in Africa. And I myself feel deeply honored to be part of this step. I hope to contribute to increasing economic, cultural, tourism and people-to-people exchanges.